Proposing Soon? Consider Buying Your Ring Online! So you’re planning on getting engaged? Well, congratulations! Engagements are such a beautiful thing! However, there are some things you should do before you pop the question. You have to think about the location of the proposal, what you’re going to say, and of course, the ring. When it comes to engagement rings, there are many avenues you can take. You could to a store and shop for the perfect ring there, but what if we told you there was a better option? Shopping for engagement rings has drastically changed over the years. Sure, people would normally go to a local or corporate-driven jeweler. But today, more and more individuals are avoiding going to a couple of jewelry stores, only to get stressed out because they can’t find that perfect ring. Instead, people are choosing to purchase engagement rings online. There are many benefits that come with choosing to buy rings online. And to help you plan part of your engagement, we’re going to share six reasons why you should buy your engagement ring online! In today’s world, consumers love online shopping. According to a study in 2016, an estimated 1.61 billion people worldwide purchase goods and items online. Online retail stores have made shopping easier than ever, without even having to go to the store. In addition, online shopping is now safer than ever. We have the luxury to search and select the perfect engagement ring, as we have almost an unlimited amount of options to choose from. You no longer have to deal with the fuss and stress of having a salesperson constantly pressure you into making a purchase that is way out of your budget. If you have ever shopped for rings before, you know how overwhelming the process can be. Just when you think you have found the perfect one, you find one that is slightly better. Or, maybe you found the most beautiful ring, but it’s out of your budget. Buying an engagement ring is a big purchase, in fact, depending on which ring you get it can be the largest single purchase that a couple will make within the span of their relationship — not including a vehicle or home, of course. There are a lot of things to consider when purchasing a ring, like the size, cut, price, and more. While you may be hesitant to purchase a ring online because you aren’t able to see all of the facets, you can still view and compare different types and rings and their specs. Plus, don’t forget, if you purchase a ring you aren’t happy with, most online ring sellers offer a reasonable return policy. When you shop at brick and mortar jewelry stores, whether a big chain retailer or a local, independent store, inventory is limited. You may find a great ring at a decent price, only to find out they don’t have it in stock and won’t have another order until after you planned on proposing. Online ring stores have a variety of selections that are in stock and ready for shipment. You can find ring products in a variety of colors, cuts, styles, and more. With shopping online you can choose a ring that fits your taste and budget. When you shop online for any product, you’re most likely to find better prices for upscale items, like TV’s and engagement rings. Unlike brick and mortar stores, there are no overhead costs when you shop for rings online. When you choose to shop online, you’re basically instantly saving some extra cash. Shopping online allows you to focus on buying one thing and the cost-benefit will be directed to you! Online shopping is available 24 hours a day, 365 days a year. Being able to shop whenever makes it convenient for those with busy schedules. Gone are the days of having to plan a day to spend hours trying to find a ring at a retail or local jeweler. When you shop for engagement rings online, you are able to do it at your own convenience and can take your time to ensure that you do not make an impulsive decision. With online shopping you have the power to shop wherever you want and whenever you want! Just because you buy an engagement ring online does not take away from the actual ring buying experience. Sure going to a store and looking at rings is fun, but after experiencing the overhead costs and pressuring sales-people, it really isn’t anything to write home about. In fact, purchasing engagement rings online can make the experience even better! When you choose to jump from one brick and mortar store to the next, it can quickly become stressful and a huge hassle. When you should for rings online, you still have access to customer support, but only when you want or need it. With all the options online, you can take the time to find the perfect ring that your partner will cherish and love forever. Feeling comfortable and confident with your decision is what helps make a proposal and engagement so incredibly special and something you will never forget! There are plenty of reasons and benefits to shopping for engagement rings online. Even so, with all the convenience, affordability, and other benefits that come with shopping online, diamond rings can still be expensive. When you buy an engagement ring there are still ways to save money. Instead of choosing a diamond ring, selecting a moissanite ring will bring additional benefits. Moissanite rings are a great choice for inexpensive engagement rings, as they are cheaper than most diamond rings, but still, feature similar characteristics. If you’re looking for an affordable diamond ring alternative, then moissanite is your best choice! And for the best selection of moissanite engagement rings, try shopping at MyMoissanite.com, an online moissanite provider. 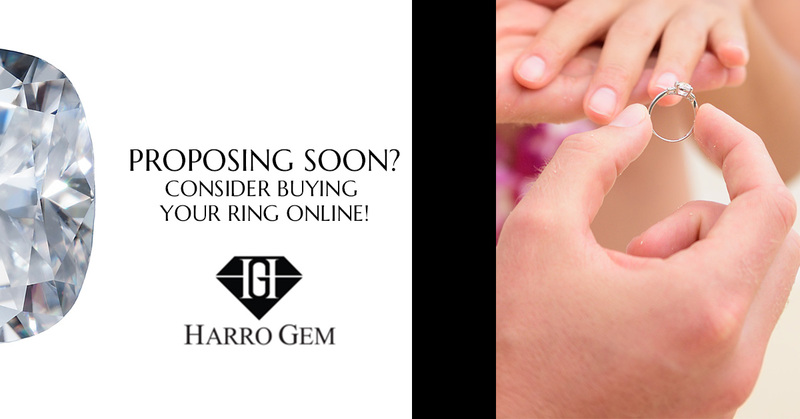 Harro Gem specializes in fine jewelry, offering the whitest, most beautiful moissanite that is available on the market. Don’t believe us? Shop now and find the moissanite ring for your proposal and engagement.